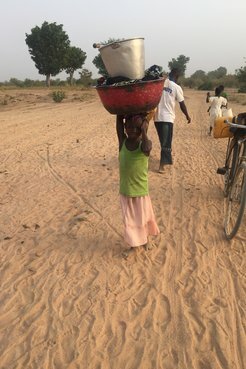 It can take a young girl in rural Ghana about an hour to walk to and from the river to fetch water. 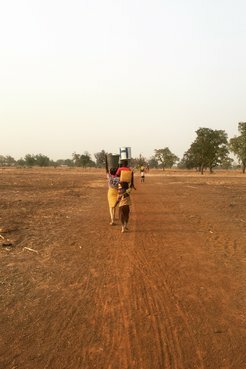 Women and children haul water from the river to Keshia’s community, 30 minutes away. She does this task four times or more a day, in the morning before school and a few hours before dinner. Her family will use this water to cook, drink and bathe. 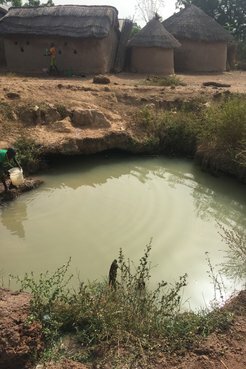 So, it was no surprise during my community’s needs assessment that their main request for my two years of Peace Corps service was to have easy access to clean water. The community has never had a clean source of water, and depended instead on a river about 30 minutes away. I discussed with my community how we could work together to make this happen and how it would improve their lives. The women who produce shea butter said they often had to reduce their production due to water problems. For example, they use the same water several times to boil the nuts, an unsanitary process for producing shea butter. This practice causes low quality butters that are not viable for the market. Children collect water for cooking, drinking and bathing from a local river. They also shared how much easier the task of parboiling rice would be if water were easily available, and the time wasted on fetching water that could be applied toward improving productivity. These practices, which make a significant contribution to the livelihoods of these women, have been hindered by lack of easy access to water. Their concerns were heartfelt, though I couldn’t help but think of another missing and important reason clean water was needed: the consumption of the parasite-filled water was dangerous. Watching young kids and babies consume this contaminated water on a daily basis broke my heart. Thinking about the long-term effects it could have on their health, I knew something had to be done. A few months before officially moving into my community, I went on a short site visit where I inadvertently consumed water from the river. Unaware of the source, I became very ill and had to end the visit early. My community members were shocked but happy to see me return after swearing in. They didn’t think I would return after what happened. However, that experience propelled me to come back. From then on, making sure my community got access to clean water became my number one priority. I came across a U.S. African Development Foundation-funded project through New Energy, a Ghanaian organization, in a neighboring community. A solar-powered filtration unit was constructed to provide clean, filtered water. I rode my bike there at least four times a week to fetch water for bathing and cooking. The system is very efficient and I wondered if my community couldn’t benefit from it as well. I spoke to my contact person about this and we were able to get in touch with the head of New Energy about a possible extension. Over the course of a year, we had previously tried several options to get clean water, from drilling boreholes, to a filtration gallery and even dams. The terrain of my community made it difficult to find water, leading to 10 failed borehole attempts. The filtration gallery and the dam were extremely costly. We needed a financially practical option that the community could assist with, in addition to support from a grant. Their financial participation would encourage sustainability of the project. New Energy was our best hope. 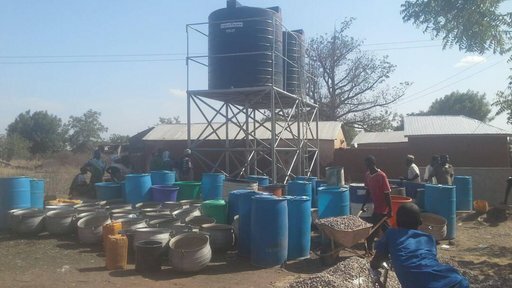 Clean water is piped from a nearby community and stored in two 10,000-liter tanks for consumption. Applying for a U.S. Agency for International Development-funded Feed the Future grant through the Peace Corps was the best option to support the community in this endeavor. Utilizing easy access to water to meet their community-based agricultural needs will lead to enhanced production of shea butter and rice processing, as well as improved food security by promoting more home and community based gardens. The grant funds were used for the completion of the piped water project, which included piping water two kilometers from one community to another and reserving the water in two 10,000-liter tanks for consumption. With the support of the district assembly and the extensive labor provided by the community, we were able to complete the project and give life to the community. It’s so encouraging to see how impactful easy access to water has been in the community. You see more women preparing nuts for shea butter processing and kids making it to school on time. Hours of fetching water has been reduced to minutes, home gardens are springing up and, most importantly, the kids can now drink clean water. Across my community, there is a positive atmosphere filled with hope. Keshia Engwenyi is an agriculture Volunteer serving in Ghana. She is originally from Fort Worth, Texas.